Seismologists scan the interior of the Earth using waves produced by earthquakes, just like how doctors image their patients using medical tomography. Earth imaging has enabled researchers to find the deep origins of volcanic islands such as Hawaii, and identify the source zones of deep earthquakes. Imagine a radiologist forced to work with a CAT scanner that is missing two-thirds of its necessary sensors. Two-thirds is the fraction of the Earth that is covered by oceans and therefore lacking seismic recording stations. Such is the situation faced by seismologists attempting to sharpen their images of the inside of our planet. In 2004, when Simons was a postdoctoral researcher, he collaborated with Guust Nolet, who is presently the George J. Magee Professor of Geoscience and Geological Engineering, Emeritus, and they resolved to rectify this condition by constructing an undersea robot fitted with a hydrophone—an underwater microphone that can collect the sounds of distant earthquakes whose waves carry acoustic energy into the oceans through the ocean floor. Recently, Nolet, Simons and an international team of researchers reported the first scientific results from the innovative seismic floats, named MERMAIDs (Mobile Earthquake Recording in Marine Areas by Independent Divers). The scientists, from institutions in France, China, and Ecuador, discovered that the volcanoes on Galápagos are fed by a source which is 1200 miles (1900 km) deep, through a narrow conduit that is bringing the hot rock to the surface. Such “mantle plumes” were first reported in 1971 by Princeton geophysicist W. Jason Morgan, one of the fathers of plate tectonics; however, they have avoided attempts at detailed seismic imaging since they are found in the oceans and hardly ever seen near any seismic stations. MERMAIDs float passively, usually at a depth of 1500 m—around a mile underneath the surface of the sea—traveling 2–3 miles per day. When a possible incoming earthquake is detected, it rises to the surface, typically within 95 minutes, to determine its position using GPS and transmit the seismic data. 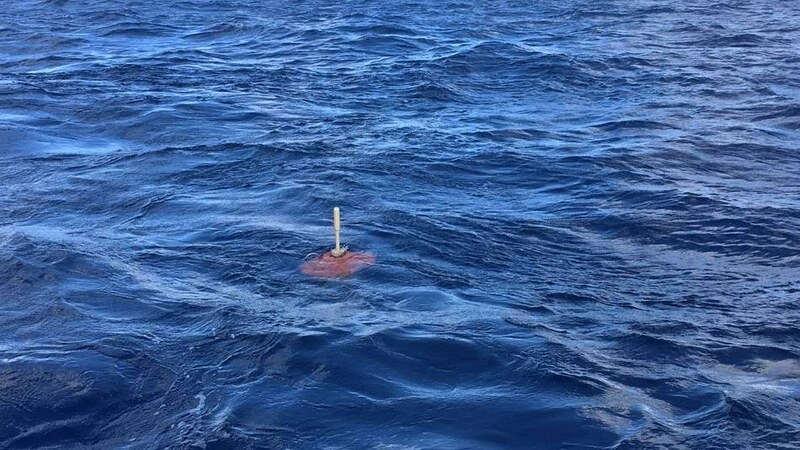 By allowing their nine robots float freely for two years, the researchers developed an artificial network of oceanic seismometers that could complete one of the blank areas on the global geologic map, where there is no other seismic information available. The unpredictable high temperature demonstrated by their model in the Galápagos mantle plume “hints at the important role that plumes play in the mechanism that allows the Earth to keep itself warm,” stated Nolet. Since the 19th century, when Lord Kelvin predicted that Earth should cool to be a dead planet within a hundred million years, geophysicists have struggled with the mystery that the Earth has kept a fairly constant temperature over more than 4.5 billion years. It could have done so only if some of the original heat from its accretion, and that created since by radioactive minerals, could stay locked inside the lower mantle. But most models of the Earth predict that the mantle should be convecting vigorously and releasing this heat much more quickly. These results of the Galápagos experiment point to an alternative explanation: the lower mantle may well resist convection, and instead only bring heat to the surface in the form of mantle plumes such as the ones creating Galápagos and Hawaii. Simons and Nolet have collaborated with seismologists from the Southern University of Science and Technology (SUSTech) in Shenzhen, China, and from the Japan Agency for Marine-Earth Science and Technology (JAMSTEC) in order to further find solutions for questions on the heat budget of the Earth and the role played by mantle plumes in it. Together, and with vessels offered by the French research fleet, they are in the process of introducing some 50 MERMAIDs in the South Pacific to investigate the mantle plume region under the island of Tahiti. “Stay tuned! There are many more discoveries to come,” stated Yongshun (John) Chen, a 1989 Princeton graduate alumnus who is head of the Department of Ocean Science and Engineering at SUSTech, which is leading the next phase of what they and their international team have named EarthScope-Oceans. ERC Advanced Grant 226837 “Globalseis” financed the MERMAIDs and their development. The University of Nice (now: Université de la Côte d’Azur) and the Observatoire de la Côte d’Azur contributed additional funding and INOCAR offered the vessel that launched the MERMAIDs.